Coca-Cola, Qualcomm, and Vector all pay higher dividends than their businesses can afford to cover. Buying dividend stocks is a time-tested way to build wealth, but investors often chase stocks with high yields without doing their homework. High payout ratios -- or the percentage of a company's earnings or free cash flow spent on dividends -- are red flags that indicate a dividend could be cut. A company's earnings growth could also peak, and a stock's decline could erase any dividend gains. Therefore, let's examine three high-yielding stocks which initially look attractive as income plays but actually conceal hidden dangers: Coca-Cola (NYSE:KO), Qualcomm (NASDAQ:QCOM), and Vector Group (NYSE:VGR). Coca-Cola is a dividend aristocrat and one of Warren Buffett's favorite stocks. It pays a forward dividend yield of 3.3%, and it's hiked that payout annually for five straight decades. 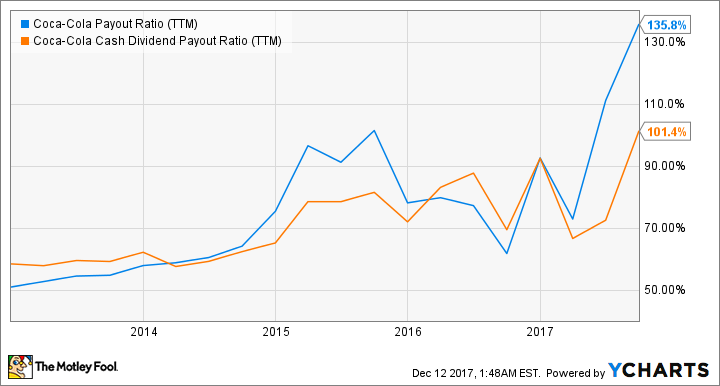 But here's the problem with the beverage giant -- its earnings fell 10% last year and are expected to remain flat this year, and its payout ratios have jumped to multi-year highs. Over the past 12 months, Coca-Cola spent 136% of its earnings and 101% of its free cash flow on dividends. Those are nosebleed levels compared to its payout ratios in previous years. Coca-Cola's growth dried up for numerous reasons, including waning demand for carbonated drinks, currency impacts, and the refranchising of its bottling operations. Meanwhile, its free cash flow growth was throttled by buybacks and its acquisitions of Fuze, Vitamin Water, Honest Tea, and Keurig Green Mountain over the past few years. Coca-Cola won't collapse, but its rising payout ratios indicate that its annual dividend hikes could shrink over the next few years, and its weak earnings growth indicates that the stock -- which trades at 23 times forward earnings -- could underperform the broader market. Qualcomm is the world's top mobile chipmaker. 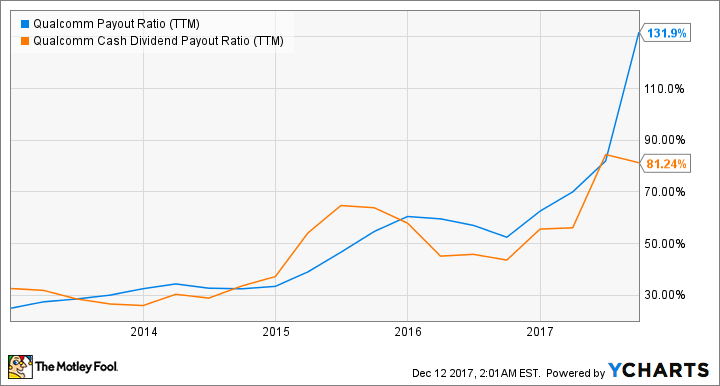 It pays a forward yield of 3.5%, it's raised that dividend annually for 13 straight years, and it trades at a reasonable 17 times forward earnings. But like Coca-Cola, Qualcomm faces big earnings declines -- its earnings dropped 57% last year, and analysts expect another 17% decline this year. 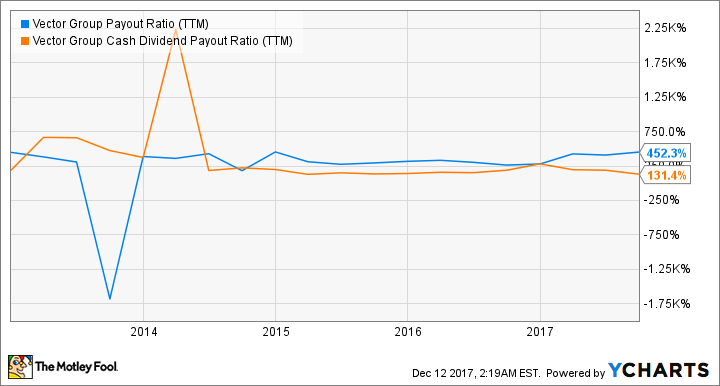 Those declines caused its payout ratios to rise, with 132% of its earnings and 81% of its free cash flow being spent on dividends over the past 12 months. The problem for Qualcomm is that its high-margin patent licensing business, which generates the lion's share of its profits, is currently besieged by OEMs and regulators that claim that its cut of smartphone sales (up to 5% of the wholesale price of each device) is too high. Those conflicts have cast a long shadow over its planned takeover of NXP Semiconductors, which would diversify its business away from mobile devices and bolster its earnings and free cash flow. All these issues make Qualcomm a very wobbly investment for income investors, especially when industry peers like Texas Instruments offer decent yields with less drama. Vector Group, a hybrid tobacco and real estate company, initially seems like an income investor's dream. It pays a forward dividend yield of nearly 7%, and a 5% stock dividend (additional shares based on an investor's total position) every year. But things seem fishy when we look at its payout ratios. Vector spent a whopping 452% of its earnings and 131% of its free cash flow on dividends over the past 12 months -- and those ratios stayed at those triple-digit levels over the past few years. Those ratios seemingly defy logic, but Vector actually funds its dividend payments with debt. 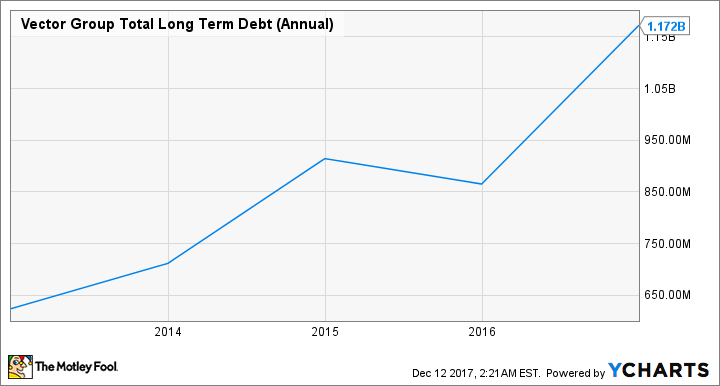 This bizarre strategy caused its long-term debt to surge over the past few years. Meanwhile, its annual stock dividend payments are diluting existing shares by 5% every year. As a result, its outstanding shares gradually increased and inflated its P/E multiples. That's why Vector trades at 73 times earnings and 35 times next year's earnings -- overheated ratios for a company which is expected to report just 7% earnings growth this year. Investors should be very picky with dividend stocks these days -- rising interest rates could trigger a sell-off in income stocks with high valuations, unsustainable payout ratios, or weak earnings growth. Therefore, investors should always do their due diligence and avoid stocks with those red flags.